In January 2014 I took one of the most important decisions of my life. I decided that it was time to start making documentaries again, to commit myself to a cause. It was time to stop selling my work and myself. I also decided it was high time to expose one of the most loathsome traditions of my country: the torture of animals during the local festivities of towns and cities, celebrations honouring saints and virgins. But perhaps most importantly still, was to discover how I wanted to do this. After 12 months of filming in secret with a commando of top professionals, we have started to reveal it all. I present to you Santa Fiesta (Holy Fiesta). June 2015. I am taking a short mental break to write these lines, in the deafening noise of the crowd-funding campaign we have launched on the US platform IndieGoGo to micro‐finance the project. For the movie to become a reality, we used this tool of empowerment in which I firmly believe, and that I have now experienced first-hand. Crowd-funding makes perfect sense for Santa Fiesta also because this documentary is a production that came to life without subsidies or the collaboration of public/private media networks. How could we think that the same media that supports a machinery of death and blood, the same institutions that allow bullfights to be shown on their channels, were to provide the means to produce this documentary? This movie could only exist if it rose from strict independence, with the support of the people. As viewers, as producers, as facilitators of a story that can not wait any longer to be told. Spaniards are a savage people, brute and ignorant. My heart shrinks, saying it out loud is hard, but not because of a nonsensical patriotic notion, nor for some wounded pride of a fan who will not see further than his flag’s colours. It pains me to accept this since being a Spaniard is what I am, as my whole family and most of my friends. This realistic love is what pushes me to work towards a revolutionary change that must be achieved against the majority, which in a different time and languages would be defined as “to free”. I am referring to that majority constituted of 25 million Spaniards (in 2012) who, according to the Spanish Episcopal Conference, participate in popular religious celebrations and are thus accomplices -as practising Catholics- of the blessing given to torture and death that occurs during such celebrations. 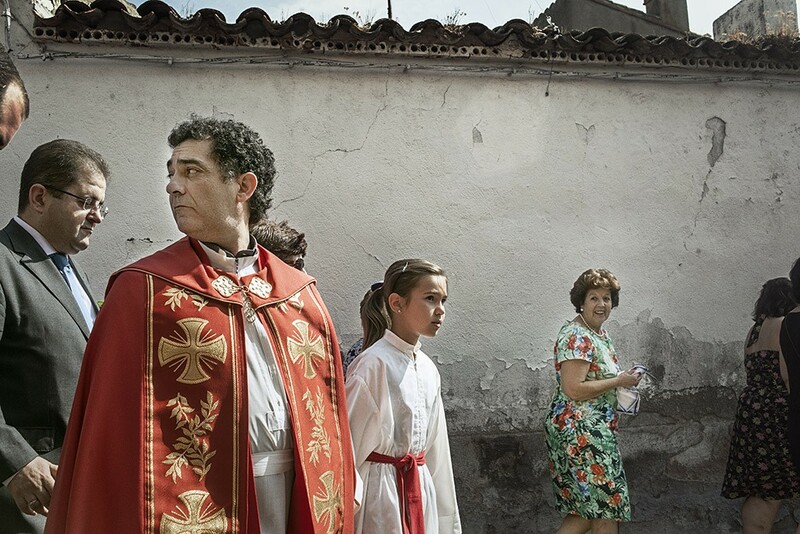 The village priest gives his blessing, the figure of Jesus Christ, the town patron saint or the Virgin Mary -in all possible variations- are walked around, and the festivities of blood and torture can begin. This happens in up to 16,000 fiestas a year, during which some 60,000 animals find their violent deaths (according to estimates of organizations like Faada). But there are only official figures from the Ministry of Education, Culture and Sport on economic activities of “Bullfighting Affairs“, as to say those performed by “professional bullfighters, farms that breed fighting bulls, and bullfighting schools”. According to the Statistics on Bullfighting Affairs 2010-2014 (download here) published by that ministry whose nomenclature I’d rather not remember, only in the year 2014, 1,868 bullfighting activities were celebrated (bullfights, bullfights on horseback, bullfights with yearlings or calves, and comical bullfights). Considering that it is customary to use six bulls for each event, 11,208 bulls are publicly tortured and killed in a year. What this report explicitly conceals are the subsidies granted to private entities for carrying out this murderous activity. This information had to be ascertained by The Green Party of the European Parliament who, in January of 2013, released the report Bulls & Taxes (download it here) in which it was revealed that subsidies from various public institutions add up to 571 million of Euros annually, and no less than 130 million come from the European Union. But then… how far-reaching can this holocaust be? The figures are devastating and unsustainable. But most painful is to witness the active approval of the Church at all levels, up to the Pope himself, mocking what the Holy Scripture and Jesus Christ himself dictate. Because of cowardice, pettiness and material interest. It is outrageous to realize how mayors and corporations cut costs elsewhere to keep the bloody fiestas going, for fear of being lynched by their most vociferous citizens. And of course it deeply disgusts me how hundreds of thousands of Spaniards, in small towns and big cities, gather to shout, laugh and applaud the harassment, stabbing, beheading, drowning, dismemberment of alive and dead animals to celebrate their own brutishness. Almost 200 animals a day are maimed and killed for fun, eight terrible deaths every hour. Can a movie end this horror? The moment I put a face to the barbarism -priests, bishops, mayors, policemen and citizens committed to celebrations of death, prayers, dances and wine- I understood that this was not an interview documentary. There is nothing worth listening to if it comes from mouths infected with madness, from political corruption that trumps our Spanish Constitution, the Charter of Human Rights, the Rights of the Child (forced to participate in these festivals of death) and the basic Animal Rights, and that argue that “tradition” is excuse enough, in the same way people justified the lynching of black citizens and slaves in the United States less than 50 years ago. There is nothing to talk about with those people who threaten, strike, spit on voices critical of their covens. The only thing that is needed is to show what really happens. And we have done that. We have portrayed ourselves as a nation watching, clapping, dancing and laughing. To make it very clear. For now we will show it all in a language that is universal and indisputable: images and sounds. Nothing else. I contemplate now the beginning of a process in which the documentary film will take shape, and share overwhelmed the first results. We endeavor to unite with the good people of this civilized world who still hesitate to join a common front. You know: your street, your city, the planet. The motto of the hip hop group De La Soul, who know a thing or two about storming the heavens. Supporters are starting to come from all over Europe, US, Australia, the next it must be you. We are not alone, and this is not a problem of a remote village, not even of Spain exclusively. It is something that concerns the whole human race, and we earthlings cannot continue to indulge this genocide.